Darcy Casselman is a software developer from Waterloo, Ontario, who likes to find out about new things and write about them online. Having heard the siren call of social media, you can keep track of his various postings on Twitter, Facebook, Google+, Flickr, Identi.ca, GoodReads, GitHub, YouTube and elsewhere. If you’re inclined, you might look at his Resume. 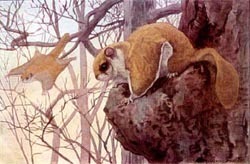 The Flying Squirrel is maybe more of an online journal than a blog. It’s hard to tell. It’s where Darcy puts down whatever seems important enough to write about at the time. He write about lots of things, like films and plays and food and sustainability, economics, Doctor Who, building software, his house, his cat, stuff he’s thinking about buying, and things he does with is girlfriend. No, not those sorts of things. This blog is the successor to an older blog, the archives of which Darcy might get around to importing into this blog someday. He wrote that old blog himself in PHP, which was fun and nice and everything until spammers showed up and made keeping up custom blog software less worthwhile. Darcy usually updates once or twice a week or so. More than that seems to stretch the content a bit. Mercifully, most posts written in the first person. Thanks for posting the pics of the demolition of B-Div. It was a trip down memory lane, having lived there for quite some time.